The Dallas Morning News: "With more tonal projection this time, Hadelich set lyrical music soaring sweetly, but he tossed off the fleet finale with apparently effortless élan. Harth-Bedoya and the orchestra collaborated savvily. For an encore, as on Friday, Hadelich whizzed and skittered through Paganini’s Fifth Caprice with jaw-dropping brilliance." 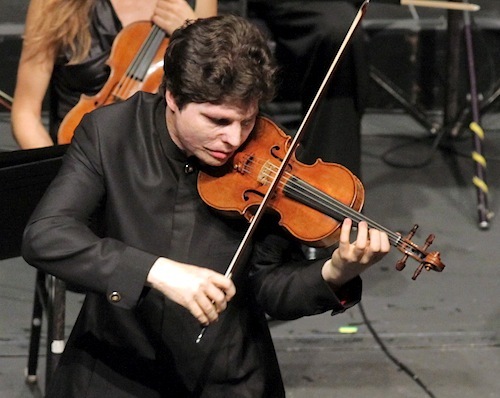 Fort Worth Star-Telegram: " Hadelich played it with a warm and accurate tone and a mastery of technique that was thrilling....Hadelich brought down the house, as he had Friday night, with an encore: Paganini’s Caprice No. 5, in a stupendous performance." The New York Times: "Wednesday’s concert was a reminder of (Bell's) irresistible talents: his unforced, easy playing and his choices of speed and volume, which are dramatic without feeling exaggerated or indulgent. Spinning out a golden wire of sound, he was answered by the coppery light char of Lawrence Power’s viola. If, in the final movement, it sometimes felt as if the two soloists were pressing a bit faster than the orchestra’s tempo, that added a feeling of urgency more than of uncertainty." The New York Times: "The somber (Mozart) Requiem was preceded by more religious exploration: Frank Martin’s elegantly angular violin concerto, 'Polyptyque: Six Images of the Passion of Christ' (1973), with Patricia Kopatchinskaja a fiery soloist, unafraid of sounding raw and scorching. Its movements were divided by five shining chorales from Bach’s 'St. John Passion.' While this made for an illuminating conversation across two centuries — 'Polyptyque' restless and impassioned, the 'St. John Passion' heartbreakingly serene — even very good music can start seeming pallid this close to the best of Bach." Albany Times-Union: "The quality and character of Perlman's playing was somewhat inconsistent and took a while to find its mark, as has been the case with a number of his other local appearances. By the time the third and final movement reached a vigorous allegro, Perlman had also rallied." Herald Scotland: "Opportunities to hear Benedetti playing big pieces in such company can seem scarce, but this was not only the sort of expressive repertoire at which she excels, but also the piece she took into the pop chart, never mind the top of the classical one, at the heart of her Silver Violin album." National Post: "This acclaimed Canadian can make the relentless passagework of the first movement sound like music-making rather than bushwhacking. His way with the Canzonetta was sombre; the finale unfolded with engaging changes of tempo rather than as a mindless charge to the finish." In other news, authorities have arrested two men in connection with the brutal murder last week of New York violinist Mary Whitaker, 61, who played with the Westchester Philharmonic and in the summer with the Chautauqua Symphony Orchestra. Her last concert there was the night before she was killed. This is one of the more detailed accounts of what happened, and it is quite disturbing: The New York Times. Our hearts go out to her family and friends.